Forecasting the requirements of ensuring a well-modulated transport system, the Government of India has in its futuristic reform document focused upon a strategy that would promote fast- paced growth that would bring about equitable and sustainable improvements in the overall living standards of the citizens. image The main idea behind the concept of Metro Rail is to make sure commuters reach on time to work and not delayed on account of lack of rapid transport. Growing urbanisations has led to innumerable problems for commuters who are delayed on account of traffic jams. Metro Rail will allow them to bypass these traffic congestion barriers. The driving force for conceptualizing Metro Rail in Hyderabad is on account of a dire need for an eco-friendly, solid and quick transport that would withstand the growing demands of an urban city like Hyderabad which is on the way of becoming a popular global destination. The Red line shows the stations between Miyapur To L.B. Nagar. 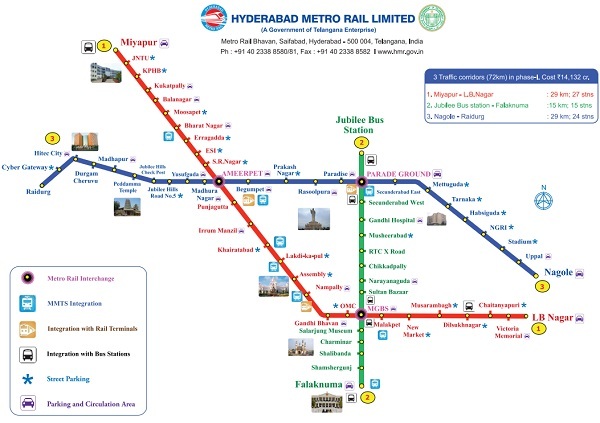 Whereas the Blue line shows the stations between Jubilee Bus Station (JBS) to Falaknuma. And the Orange Line shows the stations between Nagole To Raidurg. 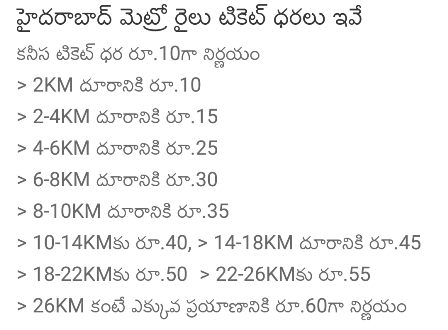 Miyapur to L.B Nagar route covers 29 Km and has 27 Stations and JBS to Falaknuma covers 15 Km and has 15 Stations. Whereas the Nagole to Raidurg routes covers the distance of 29 Km and has 24 Stations. The major Cities like Bangalore, Chennai, Mumbai, Delhi, etc have Metro Rail system. They have also introduced Metro Smart Cards for the passengers. Now, the Telangana state has also launched the HMRL. Therefore, the officials are also introducing the HMRL Smart Card to the people who regularly travel through the Metro trains. The metro smart cards are like Monthly Pass where the user can travel through the metro without buying tickets whenever they travel. The government will soon announce the Hyderabad Metro Smart Card Price details.